Oh yuck. I mean, I like sushi… but poor little goldfishies. I know! I felt so bad for them. Oh, Rubber Ducky. I remember the day after going with you my sophomore year, telling Mama Jo, my aunt and Grammy about it. My aunt asked me to tell her if the goldfish came out whole on its way out. I didn’t look. I didn’t look either LOL! All I could think of while reading this is, “How long did the goldfish live? Were they swimming around in your stomach? Could you FEEL them?? 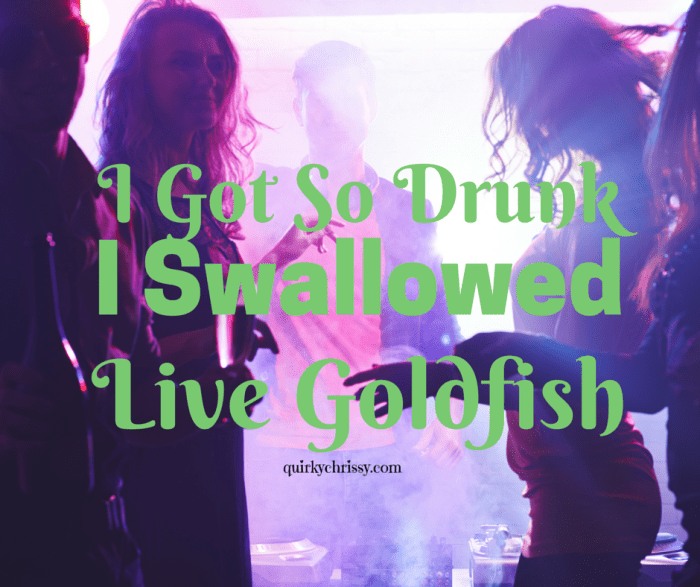 ?” So, I did some research and found out that, depending on if you had eaten before (stomach acid is higher if you’ve eaten), the amount of liquor you imbibed (liquor can euthanize fishies — and it sounds like you drank a LOT! ), and if you also drank a ton of water while swallowing the fish (which would dilute the stomach acid and give them something to swim around in for a bit), the average time of survival would be about five minutes or so. So — DID you feel them flopping around down there for a bit?? I felt nothing except the elated elevation of being hammered on lemon drops and beer. OMG that’s amazing. Google wasn’t the same back then, so it wasn’t easy to research. Gahhh poor little fishies. They were probably euthanized pretty quickly because I don’t remember feeling anything and I really did drink a lot). Did you take a video of that?